Today is the school term end of year award ceremony. Me and my hubby will be enjoying the day by attending the ceremony. 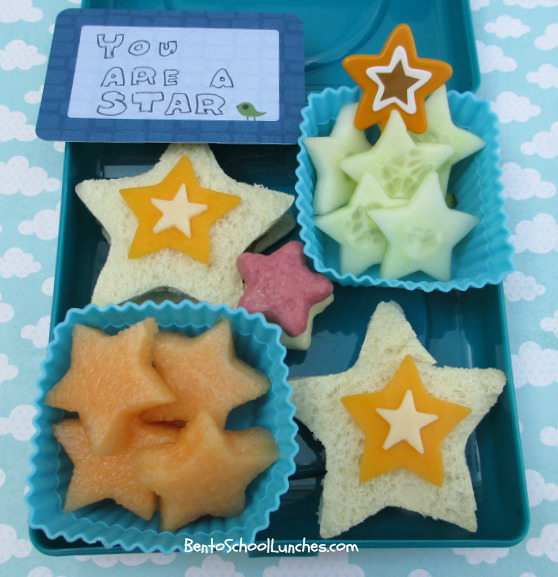 Star shaped SunButter sandwiches decorated with stars of Colby and Asiago cheese. Star shaped cucumber slices with star shaped pick and Trader Joe's yogurt stars in the center. I included a Lunchbox Love note and wrote 'You Are A Star" on a blank card. Packed in our Trudeau Fuel Everest sandwich box. I love it! The message, the lunch, you're a star! Lovely! You must be so proud of him!